The photo id for this photograph is 63, in the Schools album. 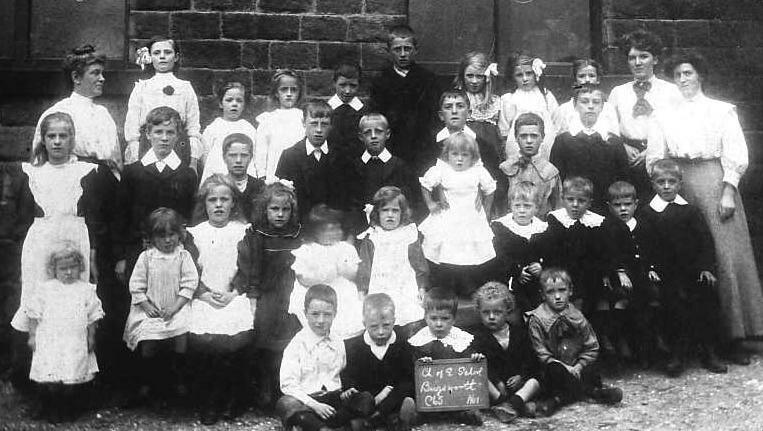 This picture of Gnat Hole School appears in Alan Watson's book Bygone Days of Whitehough & Bugsworth. It is of particular interest to me because in it is my grandmother and five of her thirteen siblings. Below is the caption which is shown with it - my additional information in brackets. Miss Jackson; Ada Founting; Rose Hill; Lizzie Wilson; Bill Neal; E Hill; Lillie Barnes; 2 girls not known; Miss Pritchard; Miss Barnes. Sally Stiles (b. 1896); John Barnes; Jack Stiles (b. 1898); Sam Hill; Harold Wilson; Harry Wilson holding Mary Wilson; boy not known; Joe Walker. Lily Stiles (b. 1905); Annie Stiles (b. 1902); N Stiles (my grandmother Nellie b.1900); D Stiles (Doris b. 1904); 2 girls and 3 boys not known; Jim Hill. G West; H West; Lewis Sleigh; Joe Sidebottom; W Walker.